Lung cancer is the leading cause of cancer death among both men and women around the world. The leading cause of lung cancer is cigarette smoking and passive exposures to smoking. There are two major types of lung cancer; Small Cell Lung Cancer (SCLC) and Non-Small Cell Lung Cancer (NSCLC). Both types spread and develop differently in the body. Chemotherapy, surgery and radiation therapy all are used to treat lung cancer in addition to experimental treatments depending upon the stage of cancer. 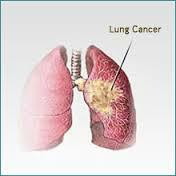 Lung cancer is the unrestricted growth of cells in one or both lungs usually in the cells that form the air passage. These cells do not form lung tissues rather they develop into tumours. These tumours grow quickly and when they become large, they start restricting the normal functioning of the lungs by restricting the lungs’ capacity to deliver oxygen in the blood. A cancer that has originated in the lungs is known as primary lung cancer while a cancer that has affected the lung after metastasizing from another part of the body is known as secondary lung cancer. Both these types are treated differently. Carcinogens are substances that damage our cells and impact their capacity to divide into new cells. Carcinogens are responsible for adversely impacting DNA and support cancer. Some of the major carcinogens include asbestos, gamma radiations and x-rays as well as gases that are found in the exhaust fume of cars. A huge number of lung cancer patients have been found to be exposed to tobacco smoke either inhaling it directly or being passive smokers. Genetic mutations or a specific gene can also increase one’s risk of developing lung cancer later in life. This form of genetic predisposition can be a gene fault that causes lung cancer by itself or it can enhance the risk of developing cancer in case the body is exposed to general external factors that cause cancer. Reduced hunger and craving for food. Involuntary falling down of eyelids. All these symptoms can be caused because of a number of other conditions and diseases so it imperative that you consult with your physician. If there is any symptom that makes you worried you should immediately get an appointment with your physician. In case you smoke and are finding it difficult to leave smoking you should ask your doctor to help you in quitting. Your health care provider can advise you medicines and products which can help you in quitting smoking. The surgeon removes the tumor along with some of the healthy lung tissue during a lung cancer surgery. Wedge resection, lobectomy, segmental resection and pneumonectomy are different procedures to remove the cancer. There remains a high chance of infection and internal bleeding after a lung cancer surgery. Powerful beams of energy like X-rays are used in radiation therapy to remove cancer cells. The therapy is done after a successful surgery to remove all elements of cancer cells in the body. In case, surgery is not possible, radiation therapy is used as the direct treatment as well. Anti-cancer cell drugs are used in chemotherapy so as to kill all remaining cancer cells after surgery. The chemotherapy drugs are provided in weekly and monthly treatments with the gaps present to give the patient time to recover. Sometimes, chemotherapy is done before surgery so as to reduce the tumor. Targeted drug therapy is a relatively new cancer treatment where the drug targets a particular abnormality of the cancer cell. Bevacizumab is a targeted therapy option which prevents the tumor from initiating a different blood supply. Erlotinib is another such option which prevents production of the chemical which allows the cancer cells to grow. Patients of lung cancer are not just hogged by the painful symptoms of cancer but also by the side-effects of lung cancer treatment. The symptoms and the side-effects can be minimized through supportive care. Doctors usually begin supportive care for patients as soon as they are diagnosed to make them feel at ease during the cancer treatment. Try to keep calm. Panic makes breathing more difficult. You can try to take your mind off the issue and to not panic by meditating, praying, thinking about your favorite holiday location etc. Look for a relaxed position. You would find it easier to breathe by leaning forward and placing yourself in a relaxed position. Pay attention to breathing. Whenever you find it difficult to breathe, try to focus yourself on breathing and try to make an effort to move your diaphragm controlling muscles. Focus on finding a rhythm for your breaths by pacing them yourself. Avoid energy sapping tasks. Cancer patients tire out quickly because of shortness of breath. It’s best to avoid tasks that require a lot of energy and conserve as much of your energy as possible. You should give your doctor a call if none of the remedies work and your breathing issue continues to worsen. Smoking is one of the biggest factors that cause lung cancer. If you don’t smoke there is no point in starting it now. If you do smoke, please give it up as soon as possible. Also, let your children know about the perils of smoking early on so that they can easily handle peer pressure in this case. Try not to stay with people who smoke. Choose non-smoking areas in public. High ratio of radon in homes is also a cause for lung cancer and you can ensure that the radon level isn’t high in your home by getting your home checked. To get your home checked for radon, you can visit a local American Lung Association Office or the local chapter of the public health department. Avoid being exposed to carcinogens and toxic chemicals as much as possible by following the precautions listed at your office. You can also talk to your doctor to know about the measures you can take to avoid exposure to carcinogens at your workplace like the use of a face mask etc. A healthy diet consisting of fruits and vegetables that provides you the needed nutrients and vitamins should help you keep yourself fit. If you follow such a diet, you would never need vitamin pills which can raise the chances of cancer in regular smokers according to research. If you don’t exercise at all, begin slowly and then try to make sure that you work out more than twice a week.